Line Marr is a Master Trainer for the AQX program. She has been active in the fitness industry for over 30 years as a leader, Trainer and Master Trainer. Line always shares her passion for fitness through her sense of humour and solid knowledge of the aqua world! Line's certifications include FNB - AQX (Aqua Fitness Leadership), C.O.R.E Cycling, Spinning Level 2 Instructor (Mad Dogg Athletics), YogaFit Level 3 & Restorative and CanFitPro (PTS & FIS). Line co-authored AQX AquaCycling, and is a Master Trainer for that certification course. Line lives in Fredericton N.B. and is now enjoying semi-retirement while remaining active in the fitness industry. Connie Jasinskas, M.Sc. created AQX to meet the growing need for high-quality, affordable instructor training and certification. Connie is a passionate instructor-educator with a wide variety of land, water, and rehabilitation experience. She has created numerous training resources for a variety of certification organizations. In 2011, AQX – Aqua Leadership Excellence – was launched at the request of City of Kitchener - the first AQX Subscriber! AQX is an in-house training program, designed to qualify and certify life guards (and others) to teach aqua fitness. Since then, hundreds of instructors have been trained and certified in basic leadership and five AQX specialty programs. The AQX program is now widely used in five Canadian provinces and the territory of Nunavut. For more detailed information about Connie's work, you will find her bio on the home page of this site. For more information about AQX training and certification, click the linked words. Monique has been active in the Aqua Fitness world for more than 20 years. She stumbled upon Aqua Fitness when looking for a safe way to stay fit while pregnant and never left! Monique’s certifications include AQX Aqua Fitness leader, YWCA Encore (exercise after breast cancer) instructor/ facilitator, AquaBility and Aqua Cycling. Monique is an active AQX leader, Trainer, Mentor and Assessor in her region. She is also an AQX AquaBility Specialty Course Trainer. Monique loves travel, and that's a good thing! She has eagerly travelled to train AQX courses throughout the Maritimes. Tara is a Master Trainer for the AQX program. With over 20 years of experience in the fitness industry, across Canada and the United States, she brings a unique perspective drawing on her diverse background in dance, fitness, cycle, aquafitness and personal training. She has had the pleasure of working with amateur, college and university varsity athletes and teams in addition to presenting to fitness professionals in workshop, conference and course settings. Tara is passionate about education and developing new and innovative ways to communicate and motivate participants in any fitness setting. Her certifications include; AQX, CanFitPro FIS and PTS, Keiser Cycle and BTS programs. She strongly believes that if you have your health, you have your wealth. Tara is a full time professor at Sheridan College. Lauren Rogers is an evaluator and course conductor for FNB in the group fitness stream. She has been teaching group fitness classes since 1996. Lauren was a Trainer of Trainers through the YMCA from 2001-2005. Lauren's certifications include Group Fitness (Step, Indoor Cycling, Portable Equipment) ) & Older Adult - she is an evaluator for these two designations. In 2013, Lauren added AQX Aqua Fitness Certification to her list of skills. She is an FNB course conductor and an AQX course Trainer, apprenticing with Line Marr. ​I absolutely love applying all of my skills/knowledge to help people take control of their health. Aqua fitness is an excellent vehicle to reach people with valuable information they can use immediately. I have made many fabulous friends all over the world due to my aquatic connections. I started my aqua fitness journey in 1992 when I was 5 months pregnant. I fell in love and never looked back. I took leadership certifications (AEA, CALA, AQX) and train the trainer certifications (CALA, AQX). 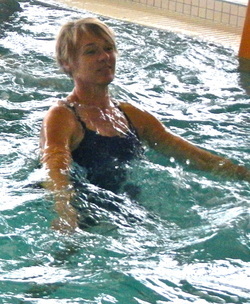 I studied aquatic therapy with physiotherapists in Nova Scotia, attended therapy conferences in the USA. I fell in love with Watsu and obtained Watsu I, II, III. I have been studying and teaching aqua fitness for 25 years. AQX in my opinion, is the Gold Standard in aqua-fitness training. I proudly train for AQX. Currently, you can find me on the decks of 3 pools. I teach aqua fitness, shallow/deep combination, and Fluid Zen. On the weekends I deliver Qigong workshops.